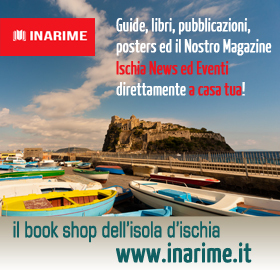 With its fifty miles of coastline, the island of Ischia, offers countless opportunities for mooring and dock shelter. Five ports are equipped, three along the northeastern coast of the island of Ischia, one along the west coast and one along the southern coast. Il port of Ischia, is the main port of the island of Ischia, to the North - North East, provides both commercial docks with ferries and hydrofoils of various shipping companies and good marina on comfortable floating docks on the rive droite of the famous port of Ischia. Its history, the only bunkering station, and its privileged position in relation to the main shopping street of the island, make it a very popular and crowded mooring in high tourist season and during the weekends during periods of low season. The port of Casamicciola Terme, exposed to the North, it is the second port of the island of Ischia in importance and organization. Natural inlet to the sea in the center of the homonymous town, the marina offers both commercial landing with ferries and hydrofoils and a secure and well-organized marina, the only drawback is the vicinity to the port to the main road of the island. Going counterclockwise small port of Lacco Ameno for its small size offers a limited tourist dock. Very interesting is the new tourist dock built along a breakwater, active only during the summer period and reserved to landing for yachts of medium and large size, best location in the heart of the town of Ameno and sheltered from the winds of the II-III and IV the sector. To the West side of the Island of Ischia, we found theport of Forio, large structure under-construction offers a good summer landing in a privileged location. A single pier in the middle of the harbor for the moorings of the boats and hydrofoils in transit, docking at the pier it is possible to take advantage of water and light. To the south side is located the small port of Lacco Amenoporticciolo di Sant’Angelo of Ischia, an enchanting place for those who love the picturesque villages of the Mediterranean culture and a peaceful harbor, enlivened by the presence of some VIP. For those who like contact with nature and the tranquility of the bays, the island of Ischia offers dozens of cozy corners to anchor sheltered from the prevailing winds.